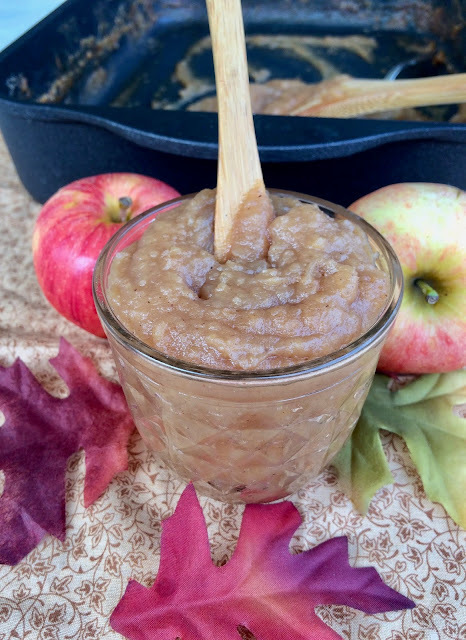 Welcome to the October Recipe Round-Up! This month's round-up brings you Halloween themed recipes with fun desserts and easy dinners for the family. 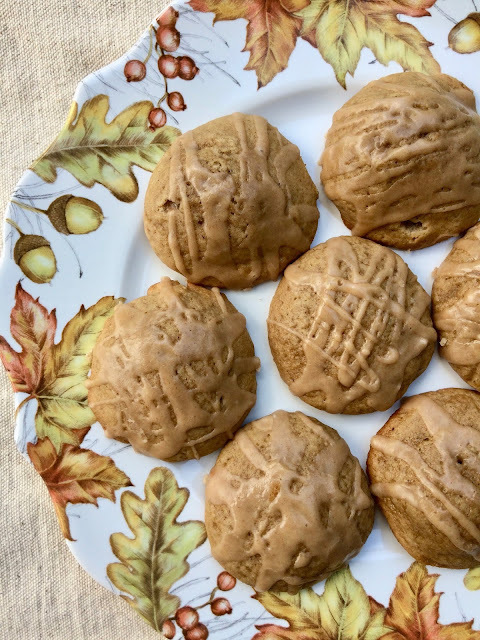 Our bloggers are sharing their favorite Halloween and fall recipes with you, including breakfast, side dishes and snacks, main dishes and ((of course)) dessert...lots of desserts and treats for that sweet tooth! Continue reading to see all this month's recipes -- Plus we have another amazing GIVEAWAY that you don't want to miss! 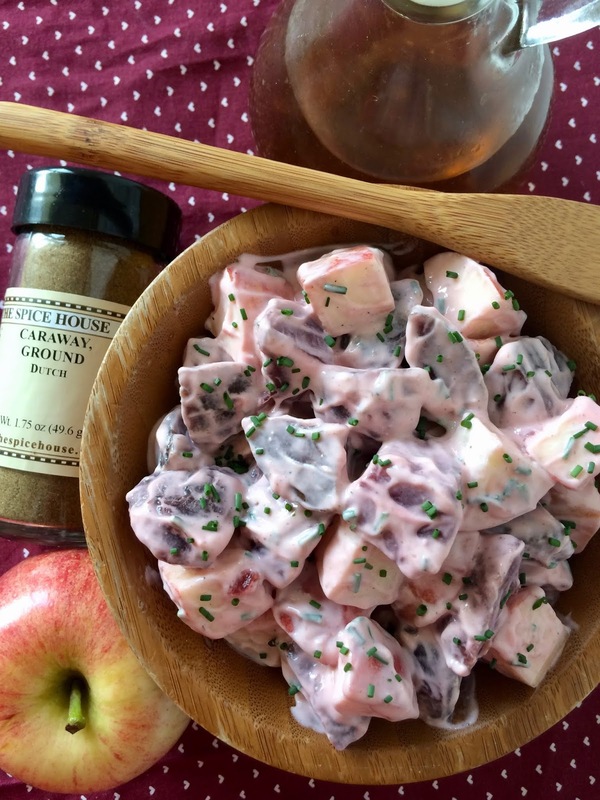 A creamy and tangy dressing coats these crisp, sweet apples and soft, earthy beets for a delicious fall side dish. 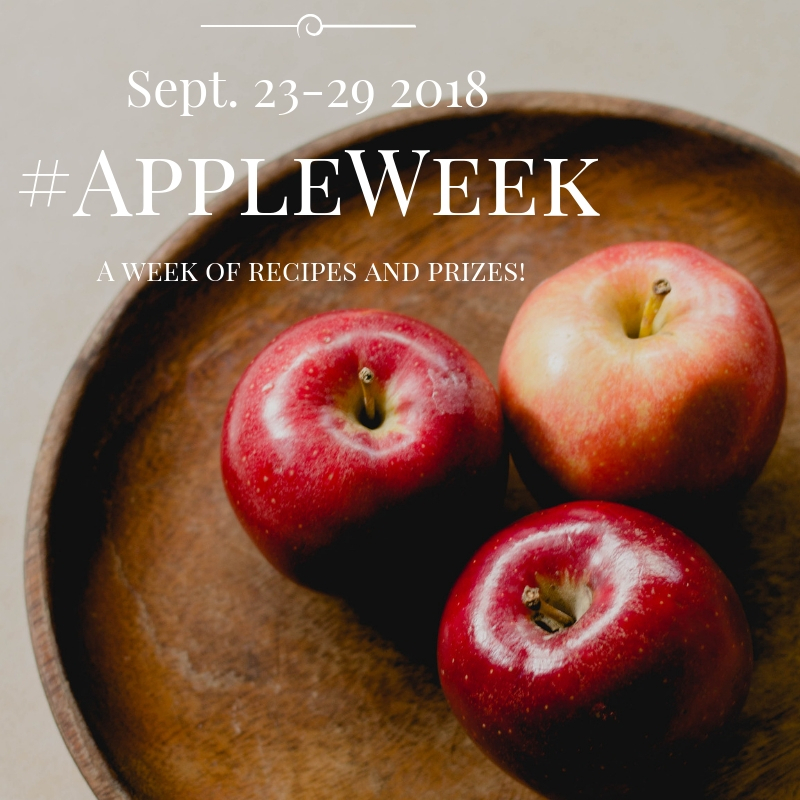 #AppleWeek is still going strong and I hope you have been enjoying everyone's amazing recipe contributions this week! I know I am! 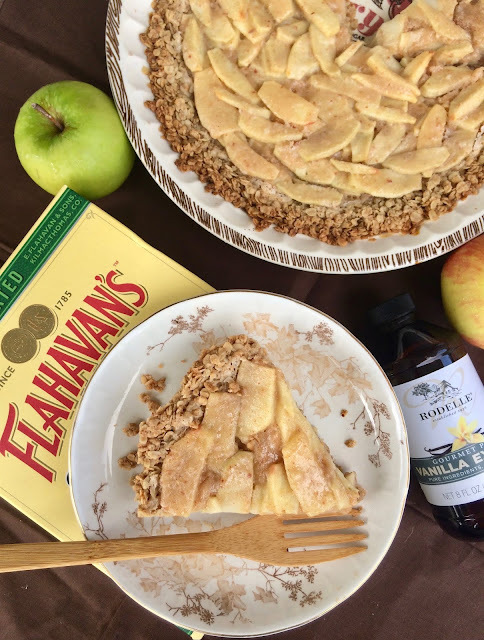 Hopefully you have found at least a couple, if not several, new apple recipes to try out this fall. Today I have a fall side dish that is super easy and also so tasty. I have to say that even my toddlers scarfed down this salad - it's that good. I received some spices from The Spice House for #AppleWeek and one that I was especially excited to try was ground caraway. I've used the whole seeds several times, but never a ground version. 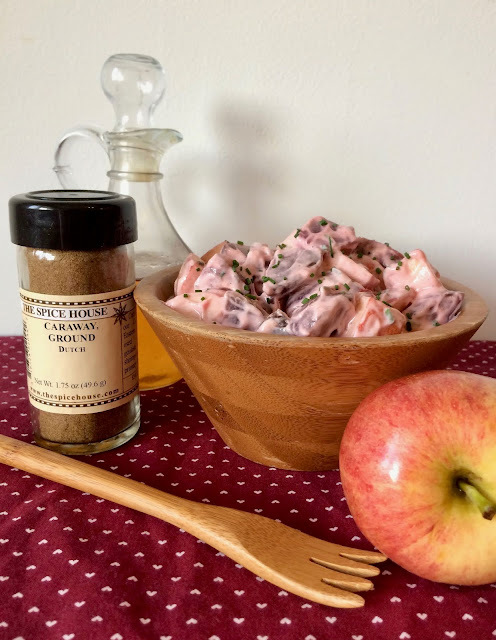 I have been wanting to make a beet and apple salad ever since I tried one years ago and I thought caraway would be a lovely compliment to the flavors. I was correct - the flavors in this salad all go together so nicely and the contrast between the sweet crispy apples, the soft earthy beets, and the cool and tangy dressing go so well together. We had this salad along with come cranberry chicken sausage and potato pierogi for a perfect autumn meal. This recipe will serve about 4 people as a side dish. 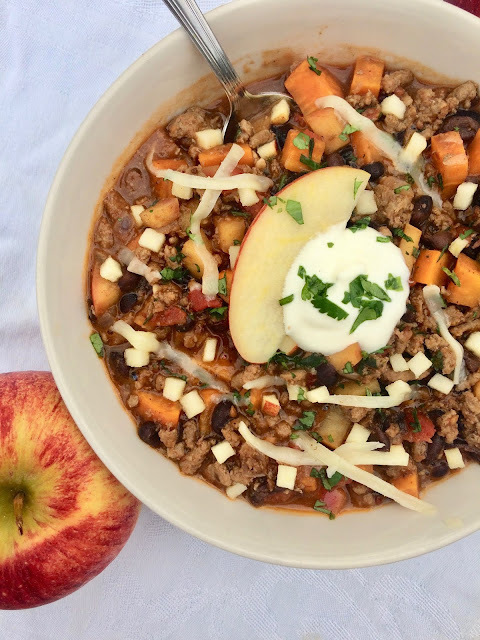 A chili packed with sweet potatoes, apples, turkey, black beans, and seasoned with chipotle in adobo, cinnamon, coriander, and more makes for a delicious, hearty, and unique fall meal. 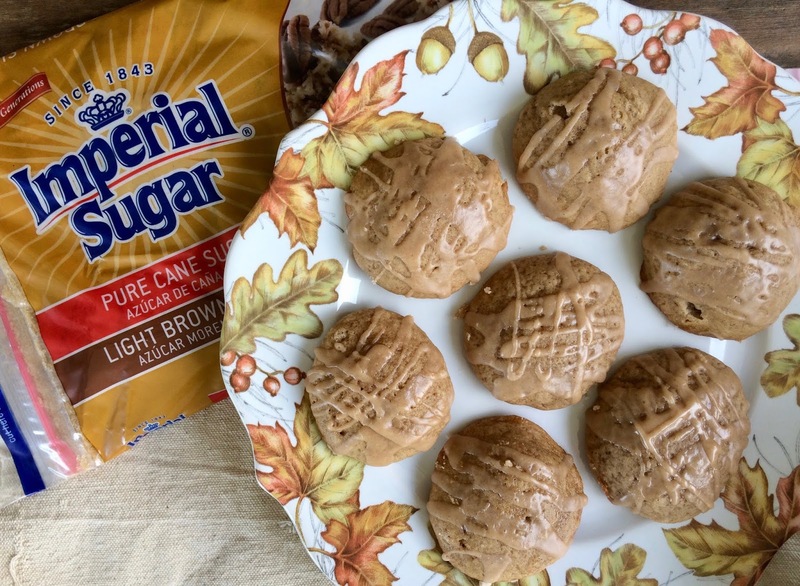 I am so excited to share this recipe with you! Apples are a huge part of our fall and my husband and I love visiting our local orchard where they have new apple varieties as well as heritage varieties. 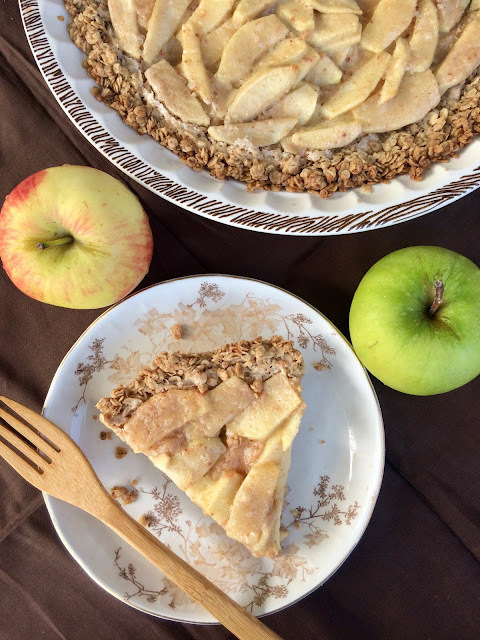 We go picking every fall and I'm always creating new apple recipes as well as old favorites. I was soooo happy to be able to receive a box of Envy Apples to try for #AppleWeek! These apples were new to me and to my family, so trying them was a big deal for us. Our twins were sampling them with me as soon as we got the box. I popped one in my husband's lunch. I gave one to my mom to take home one day, too. The kids and I loved them. My husband texted me saying what a great apple it was. My mom called and asked where she could buy them. They is no question these apples are winners! 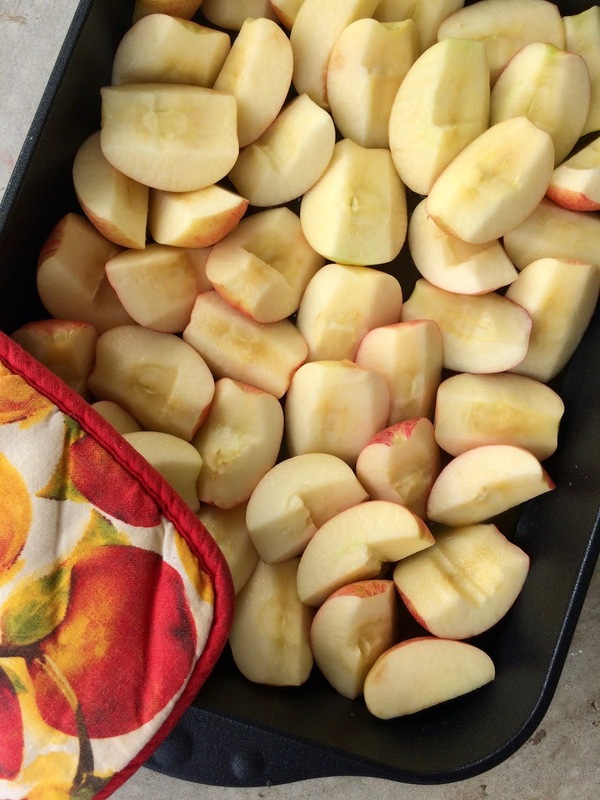 They are crisp, lightly sweet, and have a delicate apple flavor - plus the skin is so pretty in color and nice in texture. We will definitely be adding Envy Apples to our favorites now. They are so good for eating out of hand, but they are also terrific for cooking. 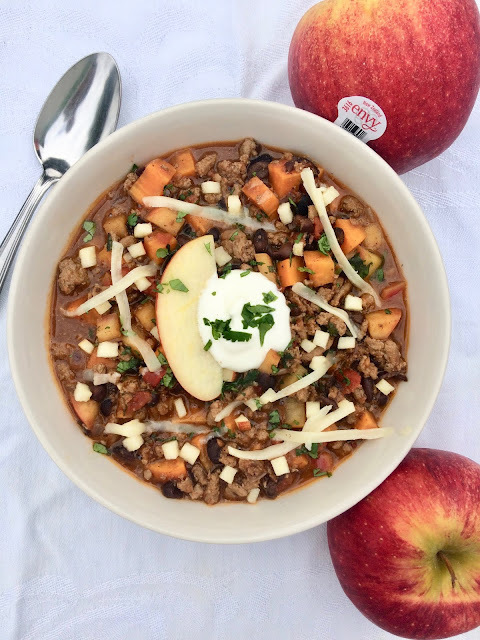 I knew I wanted to make at least one savory apple dish this week and had long been thinking of adding apples to a chili. This chili far exceeded my expectations and will be a regular in our autumn meal rotation from now on - trust me, it may sound a bit add, but all the flavors blend together for a perfect one-pot meal! This recipe will serve about 4-6 people depending on hunger level and any sides. It's great with corn bread or a side of corn chips/tortilla strips for scooping or sprinkling on top. I am so excited to welcome all of you to #AppleWeek! 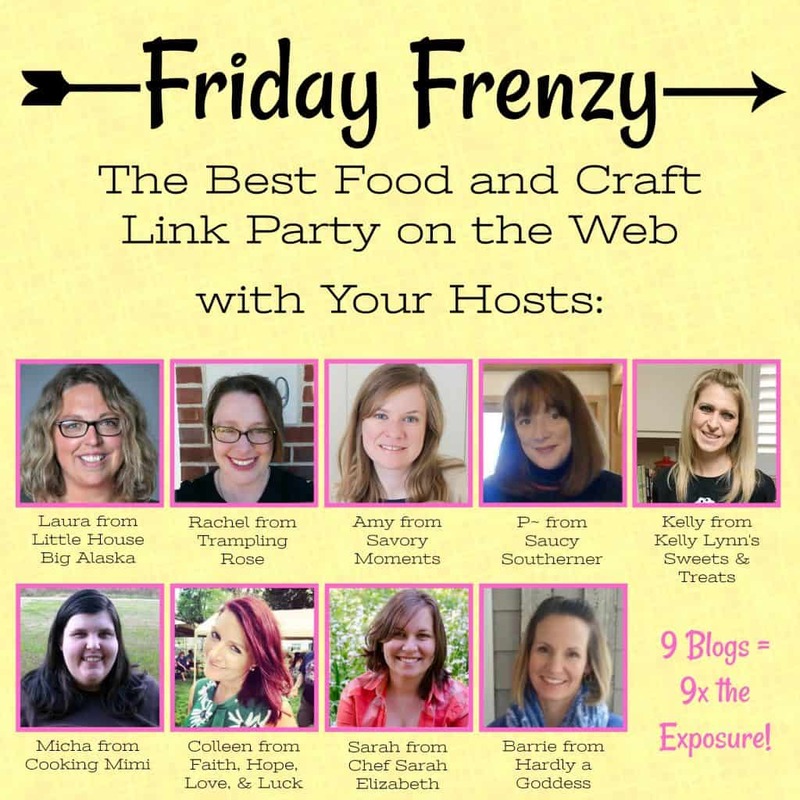 This week is going to be full of bushels and bushels of sweet and savory apple recipes from an amazing group of bloggers. I think my readers know well by now how much I love apples, so this event is especially exciting to me - I get to work with and celebrate one of my favorite fruits! Stayed tuned for five new recipes coming from me this week and so many more from the group. And, don't forget to enter to win these awesome prizes! 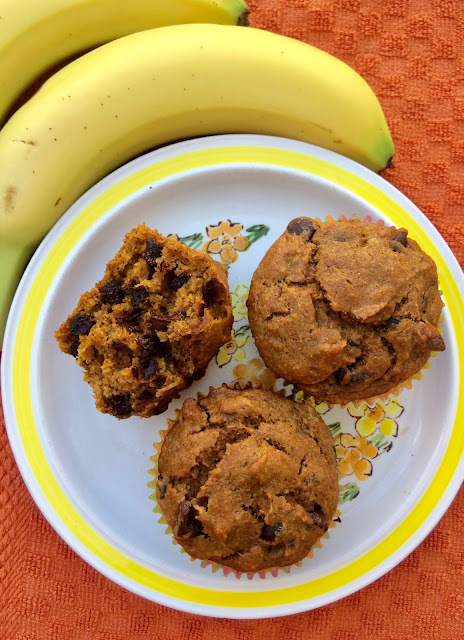 Banana bread and pumpkin bread are combined into one in these delicious spiced muffins loaded with chocolate chips. These chocolate chip banana pumpkin muffins are my contribution to this month's Fantastical Food Fight featuring Banana! Bananas are a staple in our house because the kids love them. They eat them up so quickly that they rarely turn brown, so I had to hide two just to get them ripe enough for muffin making! Muffin recipes are something I post a lot - they are so easy to make and the flavor combinations are endless. Plus, my toddlers love eating them and also helping to make them. You can taste hints of both the banana and the pumpkin - they are very flavorful from both of those as well as the spices. I wasn't sure about using chocolate chips, but I'm glad I did; they are a great addition to both banana bread and pumpkin bread. Using bananas also helps to really reduce the amount of added sugar, while still having a tasty muffin. This recipe will make 12 muffins. 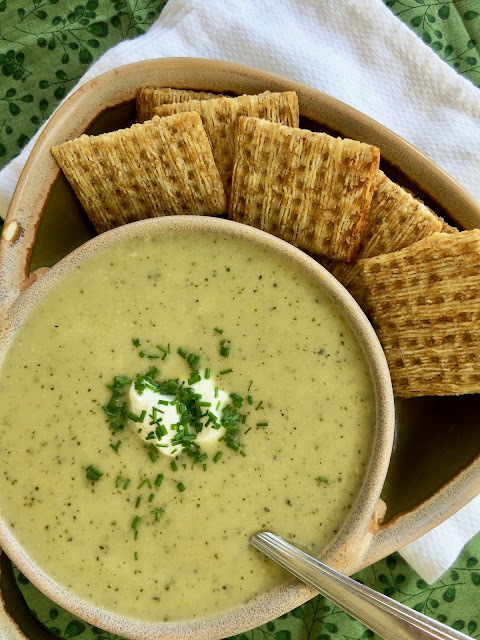 A silky smooth creamy zucchini soup is a perfect last hurrah to your summer zucchinis as we transition into fall. Fall is hands-down my favorite season, but I still have a hard time with the end of summer, especially now having children. Even though they are only two years old, the passage of time is more apparent to me now than ever. Soups are a favorite of mine, and even more as the weather beings to cool (as I write this we are in the midst of a late summer heat wave though). 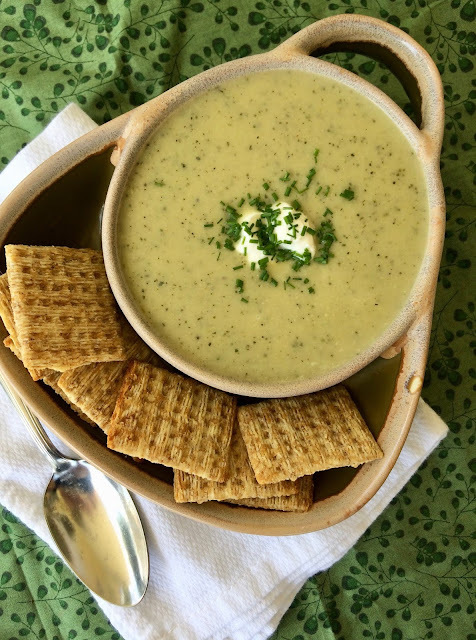 We've been gifted many zucchini this year (Which you may have guessed from all my zucchini recipes lately) and I thought it would be a great vegetable to make a cream soup from. The texture of the zucchini blends up so nice and smooth that very little cream is used here. In fact, I used chicken broth for the majority of the liquid. I kept the flavorings to a minimum, but herbs like parsley or basil would be a nice compliment to this soup. This recipe will serve about 4 people as a main dish with a side of bread or crackers and cheese. It's also a nice starter or side dish with something like a BLT sandwich. 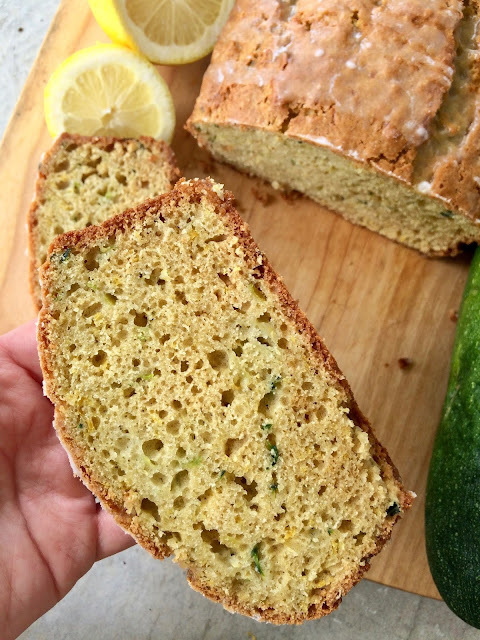 This lemony bread is studded with zucchini making it a delicious summertime quick bread. 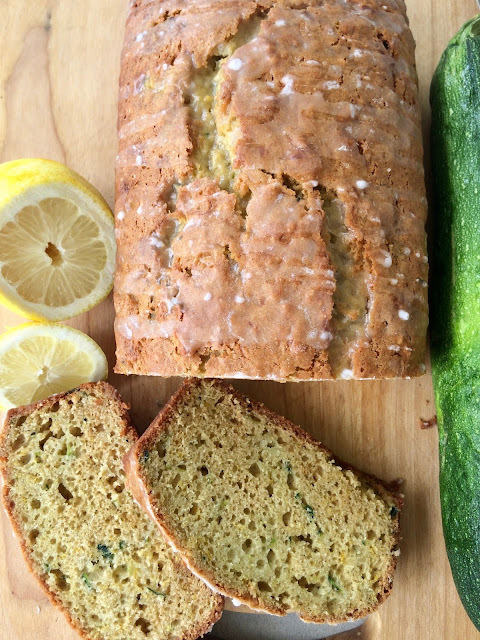 I feel like I've been sharing tons of zucchini recipes this summer. I always think that there's no way I can come up with another new way to use something, but that never seems to be the case! This bread is a change-up from regular zucchini bread - it's packed with lemon zest, a little lemon juice, and then drizzled with a lemon glaze. As usual, my toddlers helped with this bread and they did a great job of helping me dump the measured ingredients into the bowl and of eating the shredded zucchini as fast as I could grate it. They love being helpers lately and we try to embrace that and involve them as much as possible while doing work around the house and yard. I truly love that they enjoy helping in the kitchen and also that they enjoy eating what we make (for the most part). This recipe will make one loaf of bread.